Drops Free October 27 For Free App Friday! In the Know With JoJo received nothing in exchange for this post just wanted to share the freebie! Are your kids BOO-red? Are they GOBLIN up all your energy begging to be entertained? Well have no fear, My Town™ : Haunted House is here! 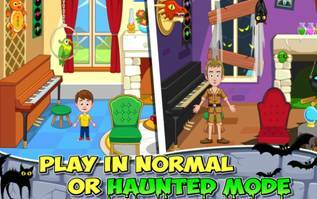 Part of the award-winning My Town digital app game series, Haunted House – available for FREE on Free App Friday, October 27, 2017 - gives boys and GHOULS hours of frightfully good interactive play and discovery. 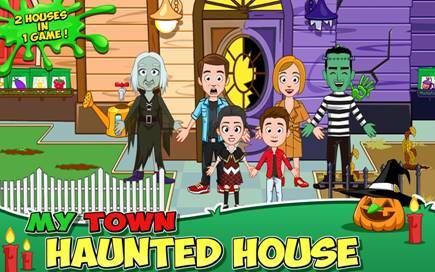 My Town: Haunted House gives players the chance to travel back and forth between a bright, normal home and a "spooktacular" haunt with the flick of a switch. Lots of tricks and treats await explorers in the whimsically creepy abode, filled with cobwebs, potions, creepy crawlies, ghosts and bats. Featuring characters they already know and love along with new ones like Frankenstein, Mummy and Witch, kids can wander through different rooms discovering dozens of hidden treasures and spells to cast. NEW - This game shares characters with My Town : Museum. This means both games are connected and you can play with any character. NEW - Save mode, Game saves even when shuts down so you can always continue your last adventure! Each house comes with 6 rooms and lots of props, foods and costumes. Play along with My Town family and 5 new characters! There are over 20 titles in the series including: Pets, Haunted House, Museum, Fire Station, Cars, Beauty Contest, Cinema, Grandparents, Preschool, Hotel, Spa Beauty Salon, Dance School, Fashion Show, Wedding, Police Station, School, Stores, Daycare, Beach & Picnic, Hospital and Home. The My Town Games studio designs digital dollhouse-like games that promote creativity and imaginative interactive play for young children all over the world. Since launching they have built games that have been downloaded 13 million times in 200+ countries. Loved by children and parents alike, the games introduce environments and experiences for hours of open-ended game play. The company has offices in Israel, Spain, Romania and the Philippines. Visit http://www.my-town.com.